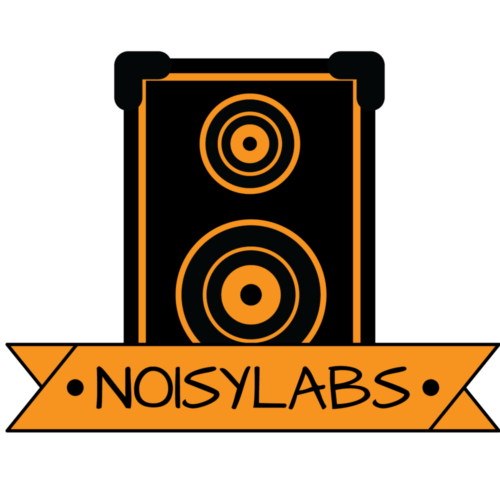 Noisylabs is all about outdoor speakers. This is why we always review Bluetooth speakers and mention how a component would fare outdoors. 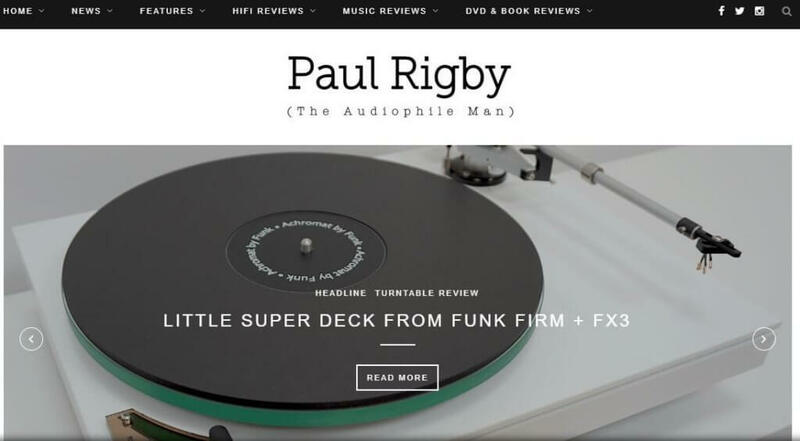 But we know music speakers is a huge world which is why we wanted to show our audience the 30 best audiophile blogs we’ve seen. These blogs are judged by their content and insights. So insights into technical aspects about audio speakers is a big factor in whether or not a blog is in the post or not. Also, we’re not just focusing on audio speakers. Some of the blogs we’ll be showing will focus on producing and sound engineering. Another factor we’ve also taken into consideration is the design of their website. Whatever makes it easier for the reader to get their answer quicker makes the site more favorable in our eyes. Specific factors like a website’s design are also something we really look at. None of these blogs are ranked because some of them don’t relate to each other. One blog might talk about producing, while the other talks about home theatre systems. It wouldn’t make sense to compare them to each other. What we did is layout the best blogs we’ve seen and let you decide for yourself if you like them or not. Enough of our criteria, it’s your turn to be the judge and tell us what you think. There isn’t anything flashy with this blog. And even though the author doesn’t provide their name, they share their story of why they started their blog. Upon first impression, we can tell the author places great importance on the technical insights of audio. All of the categories listed on the sidebar are either speakers or different components of speakers. Cables, amplifiers, and power conditioning are some of the categories the author talks about. Another reason why this blog is great is the depth the author goes into on each post. There is obvious passion because each article talks about the subtle nuances whether it’s about speakers or cables. The overall mission of the blog is to pursue hi-fi audio reproduction. In other words, it’s all about great sound quality. The ideas and tips in the posts help customers feel like they’re listening to their favorite music live. CambridgeAudio is a blog but it’s also a brand for a range of speakers. Their blog has a lot of content. From picking upcoming artists to music festivals, there is a lot to digest if you go to their website. They also focus on hi-fi speakers. Right away, when you click on an article you can see original graphics all over. This is a good sign that the blog cares about quality content. Just check this beginners guide to hi-fi speakers. The design of the website also makes it easy to navigate for different articles. At the bottom of their site is all the different blogs they have of all the different topics. We believe this blog will help any beginner get started with bookshelf speakers, indoor speakers, and home theatre systems. Check this blog out if you’re into these type of speakers as it won’t disappoint. Another blog which talks a lot about home speaker systems. This blog focuses on luxury home entertainment and home automation. Home automation goes hand-in-hand with speakers like an Amazon Echo and luxury home entertainment is more premium speakers. This is the type of content we like to provide and is similar to our outdoor speaker version. These type of articles answers user’s specific problems and is the type of content that shows how much detail they’re willing to go into. One downfall to this blog is their blog is not separated into different categories. Their design is set up as a blogroll where if you keep scrolling down you’ll see more articles that are not related. In addition to that is the overall website design. There is nothing that impresses us as for as design, but in the end, we wanted to include this blog because it has great content that most people would find useful. What we love about this site is how simple it is. Everything from the layout to the headlines makes the content stick out like a barber missing one long strand of hair. And even though its design is not colorful or flashy, users will have no problem with their content. The catch is this website is a curator of different website’s content. Once you click on a post then it’ll take you to a different site. Nonetheless, it’s still a great resource as far as audiophile blogs go. What’s great about this blog is it’s run by a couple dedicated to extreme high-end audio. Their fully enveloped in the high-end audio world as they are researchers, dealers, importers, and more when it comes to this stuff. It’s like they play all the roles for a whole company. What makes them trust-worthy is the years of experience to back it up. 15+ years of experience is a plethora of experience especially considering how many angles they approach this topic! Second, they provide show reports which show they’re ingrained in the community. They have connections with other audiophiles which makes their insight even more credible, and it also explains why they get 3 million plus page views a year. Having connections in the industry allow their work to be viewed on other audiophile blogs. If you don’t believe us then you can just check out their photos. This website runs like an e-commerce store but with helpful information. Every other audiophile blog we’ve talked about so far has had 1 or 2 sticking points, but this one has it all. If you’re a buyer looking for something to buy, they have buyer’s guides which help you decide. Very similar to the type of content we put out for subwoofers and Bluetooth speakers. But the cool part is the buyer’s guides aren’t part of the blogs. They’re located right next to the blog in the navigation bar, but they’re separate which makes it easy for the user to get to what they want, another point as far as design goes. One downfall to their blog is they don’t offer much for specific solution posts. For example, we provide posts on what to do if your speaker starts buzzing or humming, but through our scrolling of their site, we don’t see any of that. Nonetheless, it’s still a great site that provides a lot of value for audiophiles. Stereophile is great because it’s a combination of different sites we have here. 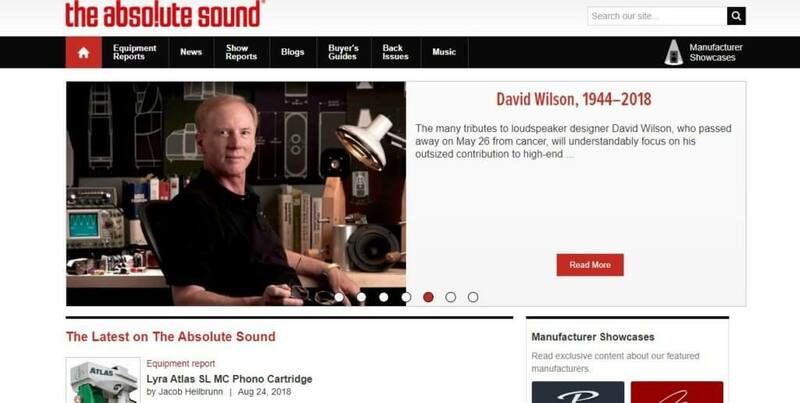 It has the great design appeal of TheAbsoluteSound, but it also curates different posts by different authors like DailyAudiophile. One way it differentiates itself from the rest is its review guides. 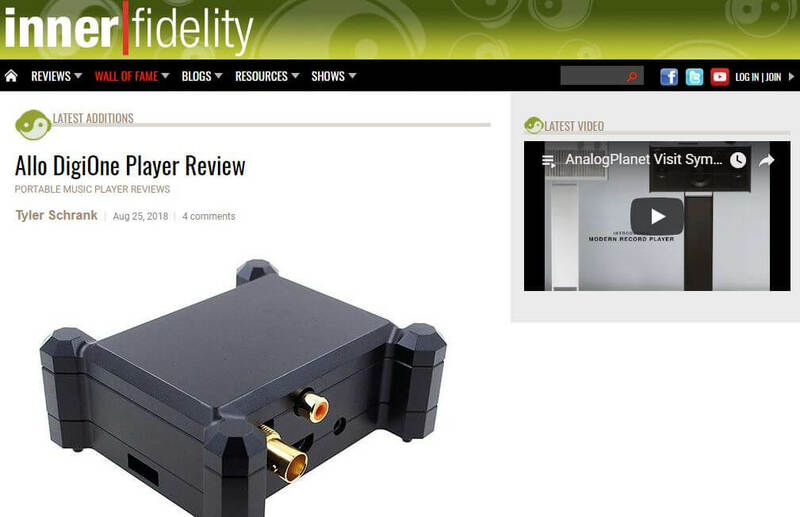 The review section provides reviews on loudspeakers, amplifiers, digital sources and more. Its design makes it easy to search for different topics you’re interested in. They also have a recommended section for products or components you’d be interested in. For those wanting a community of audiophiles then this place is also good. Their forum topics range from beginner guides to figuring out how to tweak your audio systems without spending a lot of money. Its a great resource for rookies getting into hi-fi audio or veterans well-versed into the audiophile community. One topic Noisylabs hasn’t discussed much at all is home theatres. Outdoor speakers are our forte, but we rarely dive into home theatre equipment. SoundandVision fills that void because it caters directly for home theatre lovers. Its mission is to deliver high-quality information and tools for anybody interested in the space. This means audiophiles or regular shoppers that go to their blog will come away with something every time they read an article. Similar to Stereophile, Audiostream, and Innerfidelity, Soundandvision provides a navigation bar that has a how-to section alongside product reviews. Furthermore, Soundandvision also has product categories to make it easier for visitors to review products. To top it all off, they also provide an “Ask SV” section where visitors get to ask questions. 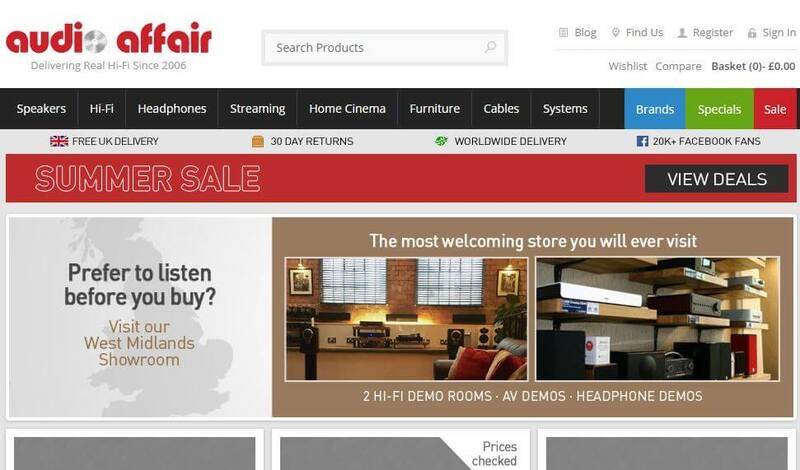 Their website helps users on the home theatre landscape. All of the top audiophile blogs above this one are more niched down compared to this one. 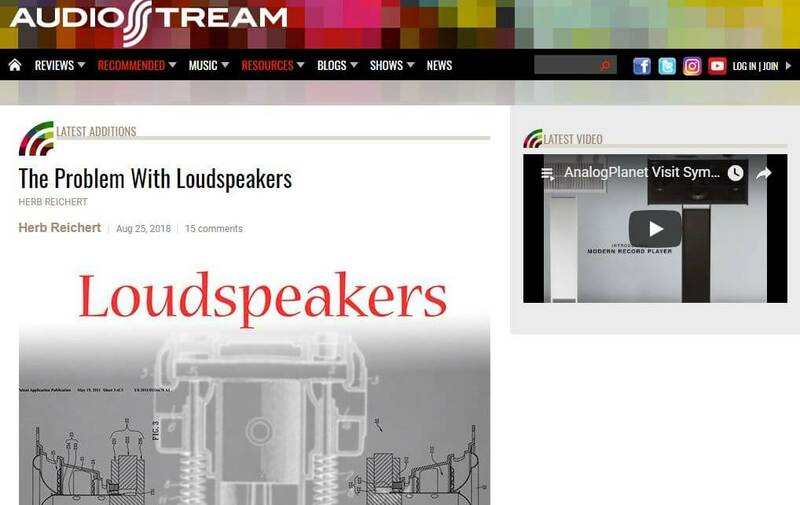 SvSound discusses speakers from a more holistic perspective. This includes subwoofers, speaker placement, audio technology, and more. One major downside to such a wide view is they don’t go as deep in technical subjects as they should. If their audience clicked on an article discussing “Tips for Setting the Proper Crossover Frequency of a Subwoofer”, then they would expect the blog to get into more technical subjects that need explaining. But this isn’t what SvSound does. Although this is the case, we don’t want to discount SvSound for what it is. And what it is, is a great blog that covers many topics surrounding the entertainment speaker world. Audiophiles who enjoy different topics of speakers will enjoy reading their articles. 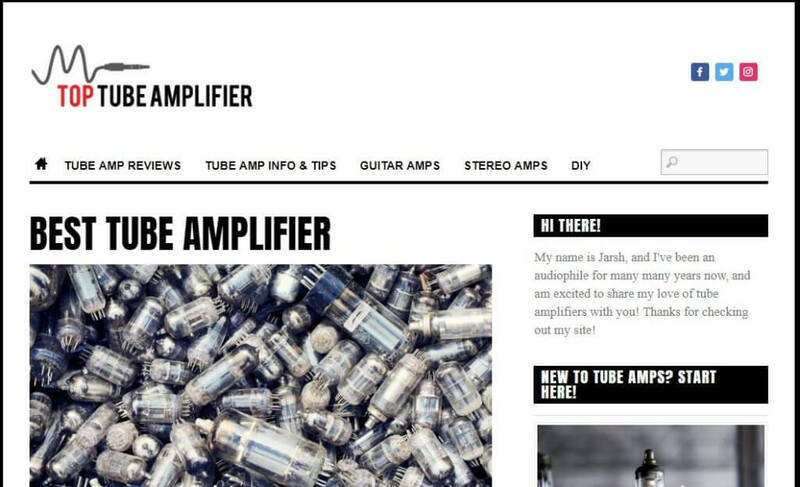 This is more of a narrowed down site because it talks about amplifiers exclusively. And when we say exclusively, we mean it. 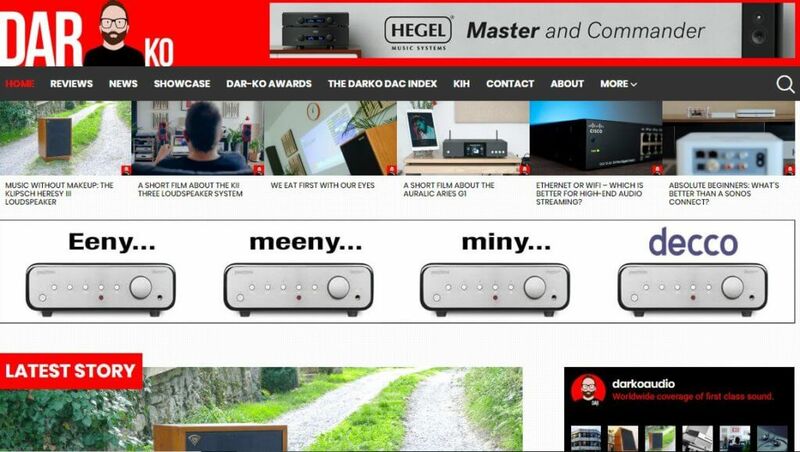 It’s a site strictly dedicated to amplifiers so you know what you’re getting. It also has a do-it-yourself section and it has amp reviews all over the place. 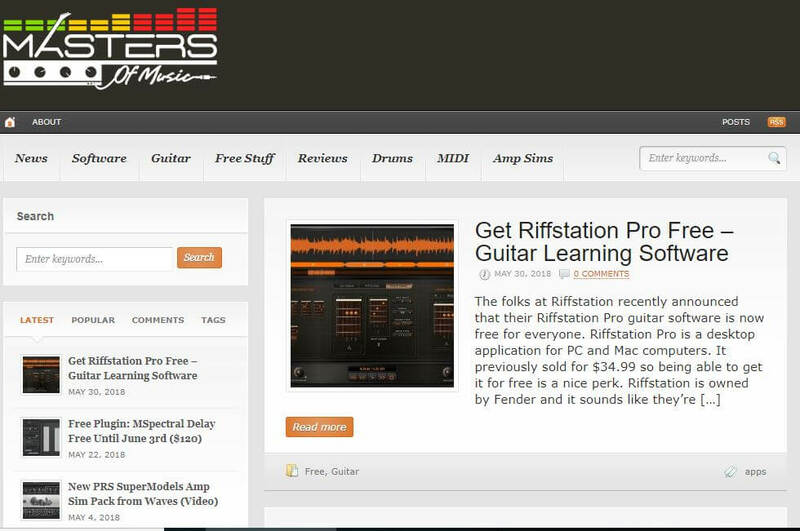 Besides reviews, the amp site also has a tips and tricks section so you can take action with your amplifiers. If the other site was a narrowed down version of amplifiers, this site is the encyclopedia for amplifiers. Once you get on the website you clearly see there are 4 different amp categories. The best part is the navigation bar also contains a section for different brands of amplifiers. What makes this site credible is its run by a special acoustic installation expert and industrial sound system expert. For those who don’t know what these terms mean then let us explain. He knows A LOT about sound equipment. Voila! And if that’s not enough to persuade you (which is understandable because this is the internet), then consider this; BestAmps is published in highly-publicized publications like The Huffington Post and Vice. Mark has been a reliable resource not only because of his credentials but because of his consistency. Combine his expertise with hard work and this is what you get! Audio product performance is the main topic for this blog. It’s a great resource for anyone curious on what the latest product works like. What makes it credible is it’s run by two experts in the audio field. Tyll and Bob are the masterminds behind this blog and they’re committed to bringing you the best quality regarding product reviews. Another great thing about this blog is the navigation. This site also has a resources section, buyer’s guide section, and easy access to the different authors contributing to the blog. Even though Bob and Tyll’s main focus is product performance, most of their work can be found on headphones. Bob and Tyll are called audio experts but what else separates them from the rest? Well…the team at InnerFidelity works closely with Home Tech Network and Source Interlink Media. Both Home Tech Network and Source Interlink Media are trusted publications which means the information Bob and Tyll provide is authoritative. A change of pace from all the review guides and amplifier is this blog. Its creator is Nathan and he is an artist who has a lot of experience with recording. Recording music is a technical subject and it’s hard to find a reliable source which stands out, but this one does the job. His expertise ranges from electronic keyboards to guitars, and even recording software. From a creator perspective, this is a lot of information to handle when starting out, but he distills the information for you making it simpler to digest. Here is a post talking about amp sims with real tube amps. 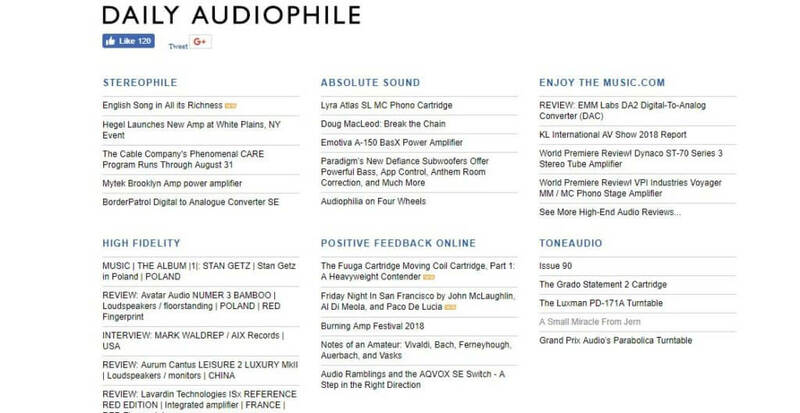 ParttimeAudiophile is a cool website magazine that covers high-end audio. But it’s not exclusive to high-end audio. It covers different topics like products, industry events, and different people entrenched in the high-end audio lifestyle. Unlike the last blog, this internet magazine is comprised of different writers. An advantage that comes with that is there are multiple perspectives you get with each read. You’re not bound to one person’s opinion on different products or trends. But one disadvantage you encounter with different publishers is you don’t develop a connection compared to when there’s one author. This is similar to when people read a book because their favorite author wrote a book. People here at Noisylabs do the same thing. Whenever their favorite author comes out with a book or release date for their new book, we don’t care what the subject is, we just want to read it. That kind of excitement happens because of the reputation the author builds. Their name is a quality brand. This is the advantage of a singular name. Topics in the blog are review guides on products like personal audio, loudspeakers, and more. Although we said this blog is covered by a lot of different writers, Scott is the person who created the blog and who is a self-professed audiophile. His story of becoming an audiophile came from his parents who were deeply involved in music. His mom was into classical music while his dad was into folk music. He also had brothers who loved 60’s & 70’s Rock. Remember, this is a time during the Zeppelin. Besides personal audio and loudspeaker guides, Scott also likes to head to audio shows and shoot photos sharing his experiences. Because of this, it’s worth your time heading over to his blog because of the passion he shares for audio. It’ll show you how an audiophile goes about their days. The design of this site is similar to a lot of the sites here. You have your navigation bar up top and it contains reviews, resources, blogs, shows, news, and anything related to audio. Not the best description if you ask us because we’d like them to get more in-depth on it, but nonetheless, it’s their about section. Doing further research we noticed a lot of their content focuses on music hardware. So headphone amps, preamplifiers, network DACs, and computer speakers are the main part of what they write about. For music engineers or recording artists who want to know more about recording music, then this is a great place to start learning about the different equipment. We finally noticed why all these sites look identical. We believe they’re in the same network of websites as they have other logos of other sites such as Stereophile, Audiostream, and InnerFidelity. Man… we wish they covered outdoor speakers to mix it up one time, but we digress. Anyways, AnalogPlanet’s main focus is about vinyl products. Turntables, tonearms, and record cleaning machines are a big part of the content they produce. Michael Fremer is the creator of the blog and he’s a big believer in vinyl. Some would think of vinyl as outdated or old school but those same people saying that don’t pay attention to history. Trends and styles are cyclical. There are a couple of reasons as to why it’s special, but some people would still disagree…so we’re just going to leave this here. 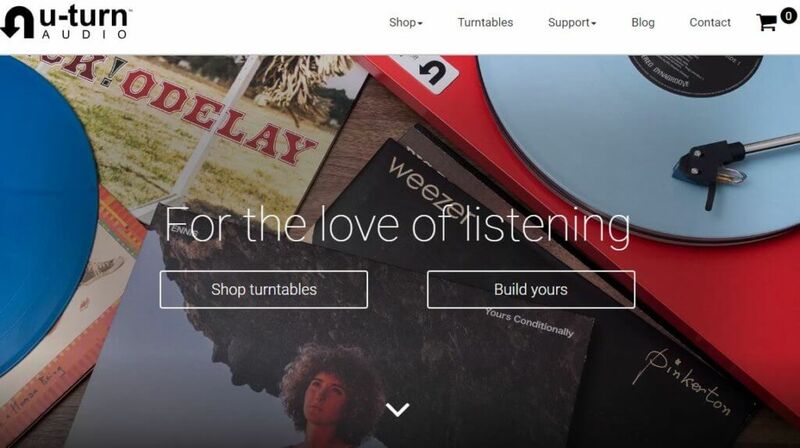 Other than its focus on analog products like vinyl, its the same setup as the other websites we mentioned. It has review guides, a blog, and posts on shows. One section we don’t see with the other sites is the tips section. Since most of our world is becoming more digital throughout, their tips section includes everything you need to know about vinyl. From learning how to clean it, set it up, and even record buying tips. 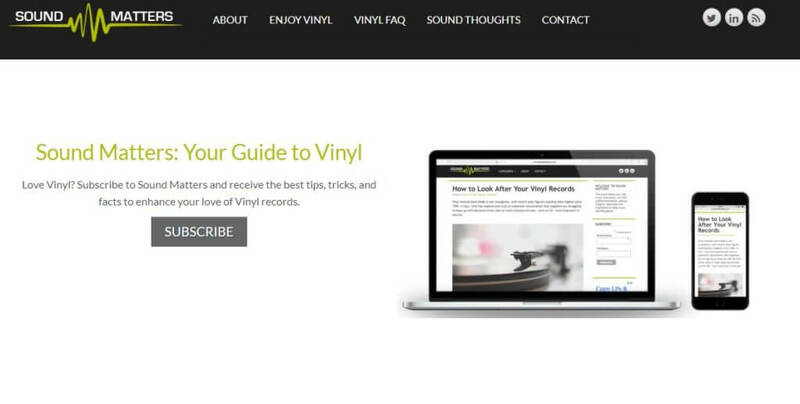 This site is designed to help beginners in vinyl take action. Finally, a site which has a new design lol. Right, when you land on the site the first thing we noticed was the cartoon avatar of Johnn Darko. He is the owner of the blog and writes alongside Srajan Ebaen and others. A lot of the content focuses on hi-fi equipment, but what they’re trying to accomplish is better sound quality for home users or outside users. We honestly don’t know what this means, but if we were to guess, then we think it’s about providing in-depth articles to those who like to give a thought on what they want to do with their audio equipment. Simply put, their writing is the tool, and the audience figures out how they want to use it. The main difference between this blog and all the others is their use of platforms. Social media seems to be a big factor for them so users of platforms like Facebook will benefit. Social media makes it easier to see their content and create communities around their content. In communities like this, you can connect with like-minded people and discuss different topics relating to your interests. It makes the blog stronger. Another platform we wished other blogs used is the podcast. Podcasts are great because your audience is able to listen to you passively. They can listen to you while going to work, in traffic, or in the office. It’s also a stronger way to connect with an audience. A community like a Facebook page is strong, but having your audience hear your voice day-in and day-out develops a strong psychological bond. In addition to that is the podcast host gets to interview guests who are experts in their field. Listening to experts give out information is faster than reading. HiFi and tech coverage is the focus of ComputerAudiophile as you can tell by the name. Techies who really want to go in-depth on the electronic side will love this site. Their review guides incorporate wireless technology, the specification of the product, and their own experiences with the product. Another benefit of going to this site is its layout. Instead of a blogroll where you have to scroll to see the next topic, a lot of the posts are centered on the screen. On the sidebar, you can see all the brands that sponsor them. To us, this is a double-edged sword. On one hand, you know they’re a legitimate site. But on the other hand, it makes it hard to believe every review they have because of their affiliation with the brand. Another problem we had was it didn’t have an about section showing audiences who they are. We believe it’s important to add an about section because not only does it create an audience connection, but it also lets us know how credible the writer is. Out of all the stories we’ve seen on blogs, this one is our favorite. It sounds like a startup and that’s why we love it. It’s like an underdog coming out of nowhere and is fed up with the current system. So instead of complaining to others, what did they do? They made their own product. It all started because they were too broke for the best hi-fi products and the cheap ones weren’t worth listening too. How did broke college guys get the money? What resulted was an analog turntable designed for today’s vinyl listener. The turntable is cheap, but more importantly, quality. The same quality carries over to their blog. If you’re really into vinyl then this blog is for you. They have guides like “How To Position Your Speakers For Great Sound” which answers your problems and illustrates them with original images. And the writing is simple with having no complex audiophile blog language. Sometimes we go on a blog and we’re just confused with what’s going on ourselves. A simple topic like “how to get more volume into your speakers” all of a sudden turns into a physics problem. That’s not the case with this blog. For those who want to learn about vinyl turntables, there’s no doubt you should check them out. 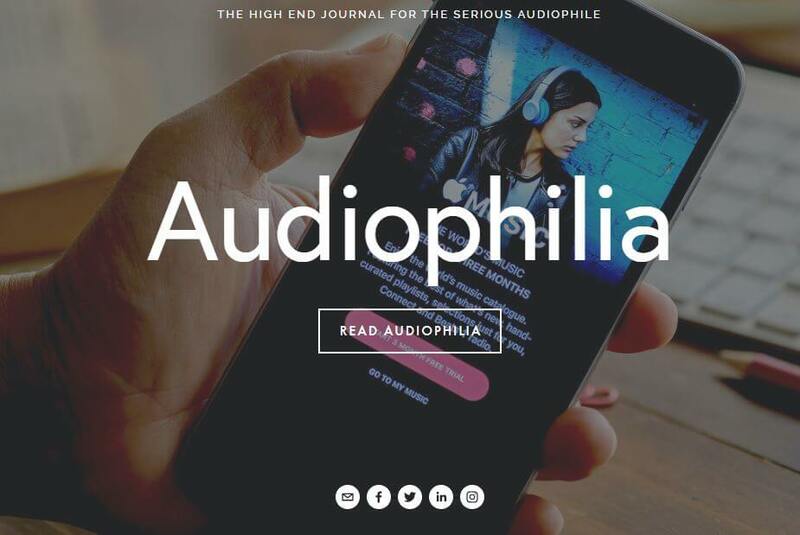 A custom-designed website made by a few collaborators, Audiophilia is a high-end journal for all things audio. What we appreciated right away about the blog is how long the posts are. Their posts are in-depth and the blog contributors that post have deep connections in the audio industry, it’s no coincidence as to why. Anthony Kershaw is the creator of this blog who’s also a classical artist. He was a flutist and conductor who has performed in North America and Europe. But that’s not all, he was also awarded the Commonwealth Scholarship, Chamber Music Prize, and the Guild Prize. Safe to say he knows what he’s talking about when it comes to hi-fi audio equipment. Manufacturers who produce audio equipment can be nominated by the reviewer and Audiophilia will rate it by stars. After the star component award and the credentials of the main publisher, we wanted to see one more component. If you don’t, we’re talking about navigation. Overall, navigation is easy for this site. But we’d like to see separate categories for different topics. Other than this there’s not much to complain about. Still a quality blog for audiophiles. Paul Rigby is a journalist who is a renaissance man. He does and knows a lot of stuff. But his main passion for years has been music and hi-fi audio equipment. His work has been on display for national magazines and a variety of websites. TheAudiophileMan is just one of the platforms he uses to share his thoughts, although we doubt he writes everything on the website, we still think it’s great. We haven’t noticed a lot of blogs combine product reviews with music reviews, but this one does. And it has a lot of genre reviews which makes it even more impressive. Usually, different blogs stick to 1-3 different genres, but this one uses versatility as one of its advantages. But that doesn’t mean it doesn’t contain the essentials. TheAudiphileMan has interviews with experts, buyer’s guides and plenty more. Another way it distinguishes itself is by discussing vinyl. Most hi-fi blogs never talk about vinyl and we don’t know why as its a big part of being an audiophile. But thankfully this blog does as we love vinyl! The focus of this blog is mostly hi-fi. It’s all about hi-fi reviews, news, and what’s trending. But this doesn’t stop them from talking about headphones and other types of speakers. Their blog is a 3×3 meaning it shows a grid of 9 blog posts until you have to skip on to the next page to see the rest. Content on this blog consists of reviews, comparisons, and posts that help readers understand more about musical equipment. One example of this is the “Hi-Fi and Speaker Specifications” post. Their how-to section is also valuable for beginners interested in the audio space. One way this blog separates itself is by talking about streaming. Most music purists don’t consider streaming, but its infancy doesn’t mean it’s not important. Streaming numbers are continuously going up every year and there’s a lot of money going into it. Recently, Warner Brothers sold their shares in Spotify for a reported $400 million dollars! and streaming is just a baby. We’ll state the obvious and say this site is about headphones. But it spreads its content around different topics like electronic accessories such as earphones and personal audio services. Another differentiator is it’s an online store hailing from India. Usually, retailers come from the United States or Canada, but since the market is flooded with stores like this, they wanted to come in and change the market. And they’re doing that by combining fashion, technology, and entertainment. What makes this company compelling is the group of people running it. All of them are young and passionate fans of music. A lot of the blogs we reviewed are run by older people (nothing wrong with that), which usually means they have tons of wisdom and experience. The same can’t always be said for younger people but they share their experiences in their posts. Plus, manufacturing a quality product isn’t the easiest thing to do, and it takes attention to detail so it’s safe to assume they know about audio equipment. Marc is the founder of SoundMatters. The passion for sound quality is always at the heart of personal blogs and this one isn’t any different. Marc’s mission is to get people to listen to music in better high-quality ways. Streaming services, MP3 downloads, and video services don’t do any justice for music in his opinion. And worse yet, playing music through headphones and laptops cheapen sound quality. If you haven’t guessed yet then Marc’s hope is for people to get into vinyl and other hi-fi audio equipment. All he wants is for people to enjoy music. Follow his blog if you want someone who’s passionate about the changing landscape of sound. This is the philosophy that brought System-Audio to fruition. At the time of their inception, loudspeakers were large and complicated much like cellphones back in the day. To divert from loudspeakers, they went the other way from the trend. What they did to break away from mainstream loudspeakers was to create a loudspeaker which was compact and actually loud. That is why he started building loudspeakers and is the main reason System Audio has a blog. He wants people to know speaker specification doesn’t matter if the speaker doesn’t sound good. That’s why articles like “how to get that extra oomph in your sound” is part of the blog’s content. But not only do they provide helpful content, they also update their audience with how the music industry is evolving. Different types of speakers like Bluetooth speakers and home speakers are also covered in the blog. Anyone interested in music speakers, in general, should visit this blog to learn more about the industry. With the addition of technology and streaming, System Audio has you covered by providing the latest and greatest on what’s happening. The first time we encountered Bowers-Wilkins was when we covered the debate between kevlar and polypropylene speakers. Bowers is known for using kevlar in their loudspeakers. Kevlar delivers a “clean” sound to all audiences and it has been so good to them they’ve been using it since 1974. But that’s not as important as their blog, correct? Bowers-Wilkins offers premium content surrounding the speaker industry. Going on their blog you can see different topics. You can see the latest news, guides on how you can get the most from your speakers, but for audiophiles, this isn’t even the best part. Do you want to know what makes visitors return? It’s the in-depth articles, guides, and insights from the foremost leaders in the sound industry. Anytime an expert who is on the bleeding edge of the industry speaks up, people listen because they know they have a good chance of learning something. It’s why investors go to Warren Buffet’s shareholder’s meetings. They want to know what’s new and want to hear Warren Buffet’s thoughts. 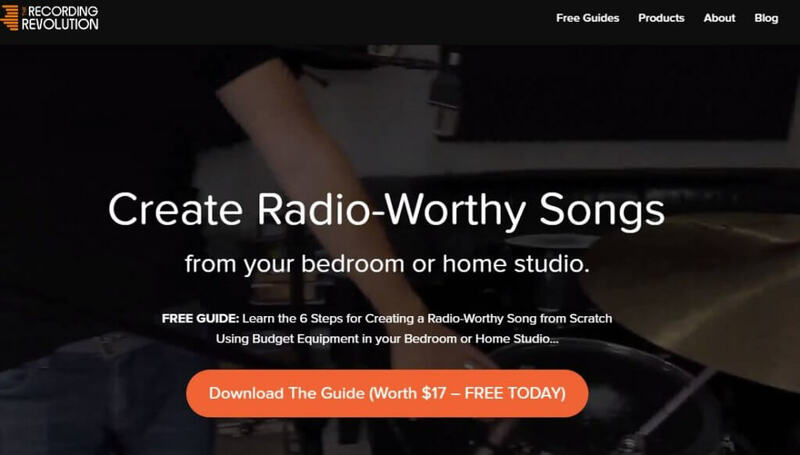 What’s beautiful about this blog is its dedicated to recording music in a budget-friendly way. Tilted more for audio engineers, this blog talks a lot about equipment and sound dynamics than actually creating music. Beginners can start with the free guides they provide. A lot of the content on the blog gets in-depth on technical topics. We appreciate this because a lot of blogs have posts, but a lot of them revolve around clickbait titles. This blog also has multiple videos revolving on 1 topic. An example of this is their videos on mixing. If you hesitate to visit this blog then you’re missing out. There is a goldmine of information! The one-stop shop for beginners willing to learn the basics of producing. There is no exaggeration on our part when we say this is the place for beginners wanting to learn how to produce. Similiar to RecordingRevolution, Music.Tutplus offers guides on learning how to write songs or figuring out which DAW to use. What differs from RecordinngRevolution is the amount and variety of guides they offer. Advanced concepts are simpler so it’s easier for a beginner to understand. Everything from voice compression to DAW plug-ins is available to learn on their site. But beware not everything is free to learn, there are some e-books you’ll need to purchase to view. Anything related to music and audio goes. For those more interested in a course, they have that too. There is no limit for those wanting to learn. 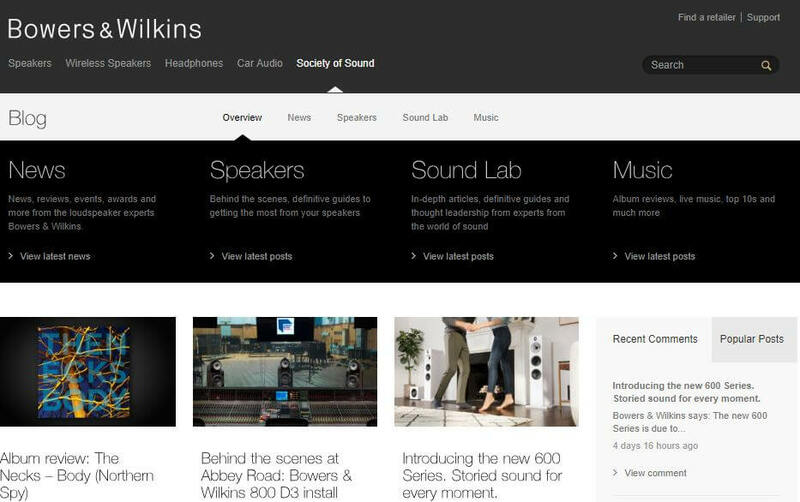 This is what makes it one of the top audiophile blogs online. This blog is about music production and recording. 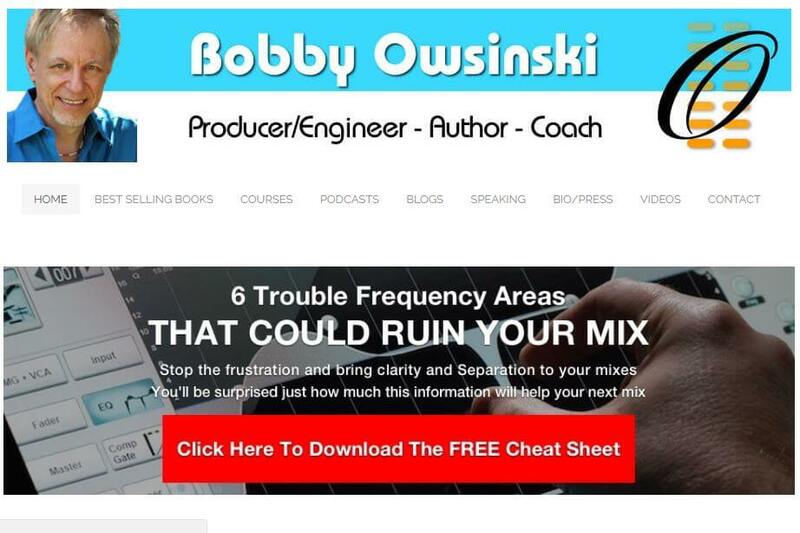 Bobby’s blog gets over 6 million views which are impressive because some of the other top audiophile blogs on this list don’t touch that number. What’s even more impressive is he contributes to many other blogs as well but he still makes time every weekday to post on his music production blog. One reason this blog separates itself from others is due to the attention to detail. A popular feature of his blog is when he breaks down hit songs. He discusses song structure, sound, and arrangement when he breaks down a song and it’s what makes him a great engineer. But the one difference is its sponsored by big names which makes it worth taking a look at. Big names like Vox and Pro Audio Files sponsored EdmProd and there’s a reason why. Even though there are festivals around the world for electronic dance music, producers, instead of individual lyricists are the stars. In the music world, artists who sing, rap, and display their voice are often the most appreciated. This isn’t the case with electronic dance producers. It’s a culture of its own and it’ll have more impact the older it gets. The reason edmprod is popular is not only because of the genre it’s serving but the specific guidance they give. 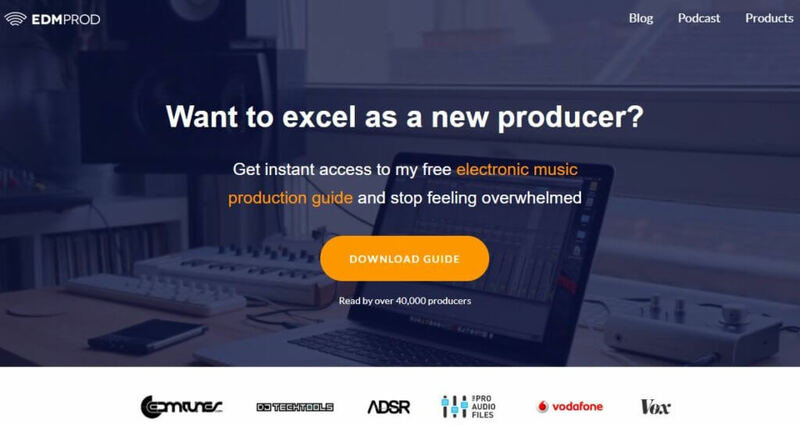 Because producers in the electronic dance scene are the stars, they’ve narrowed down their content to help aspiring producers. Articles like “5 skills all successful producers have” is the type of content you’d normally see. On top of that is the podcasts they provide. They have episodes talking about how you can grow your brand along with technical aspects like perfecting mixdowns. Any starting producer needs to check this blog out. 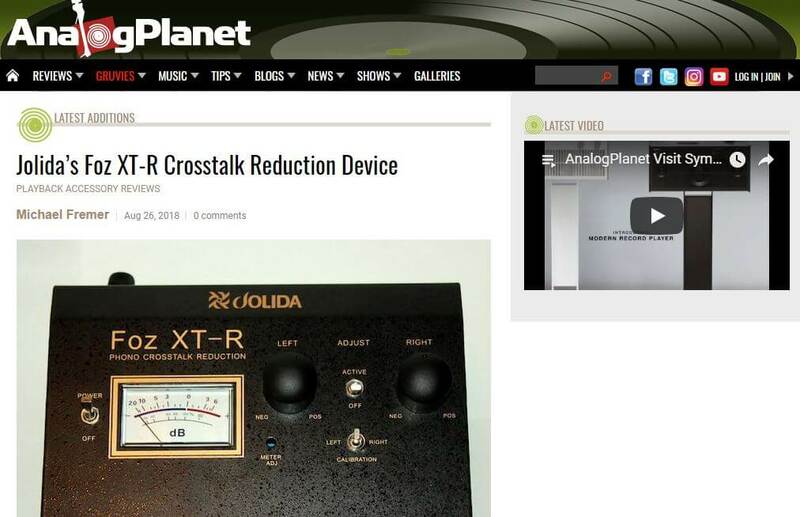 They provide so much value which makes it a top audiophile blog.